The wonderful AWACs cheesing away! Tonight, on this cool Monday evening, just moments ago, the Candy Drop candy was sorted. The AWACs did a phenomenal job of perfectly test dropping each piece from various heights in Peter’s office. 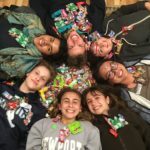 They calculated the aerodynamics of how notes would affect the flight time of each singular piece, whether on Twizzler or M&M, and they considered the volumetric mass of the bags in which the candy would be thrown out of once in the plane. Just kidding, the AWACs basically just had a party on top of a pile of candy! 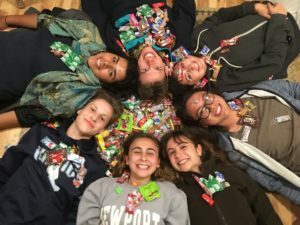 They ripped open each bag of candy, mixed it all around in one great giant pile, threw some around, ate a bunch more pieces, and repacked the candy in a few different tote bags. Now, the candy sits in PK’s office, waiting for it’s own time to shine…or should I say, pour from the sky. It’s time for me to buzz off to bed now. Let’s just hope I can sleep after this candy craziness!